The bottle tree owes its name to the unusual swollen shape of its trunk. Like other pachypodiums, this succulent stem of the plant acts as a water store that enables it to tolerate the hot, dry environments in which it grows. Its sap is highly toxic. The bottle tree owes its name to the unusual swollen shape of its trunk. Like other pachypodiums, this succulent stem of the plant acts as a water store that enables it to tolerate the hot, dry environments in which it grows. Its sap is highly toxic, and traditional hunters in northern Namibia have used this as an arrow poison.. 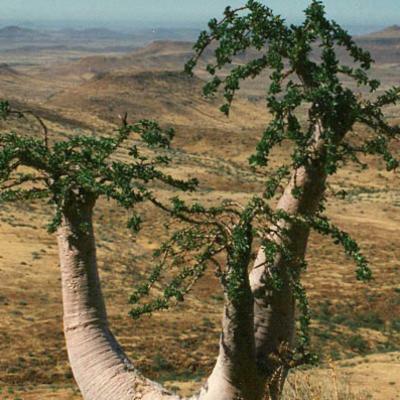 There are two subspecies of Pachypodium lealii, found more than 1,000 kilometres apart in Africa. They share many characteristics, but also have a different habit of growth. 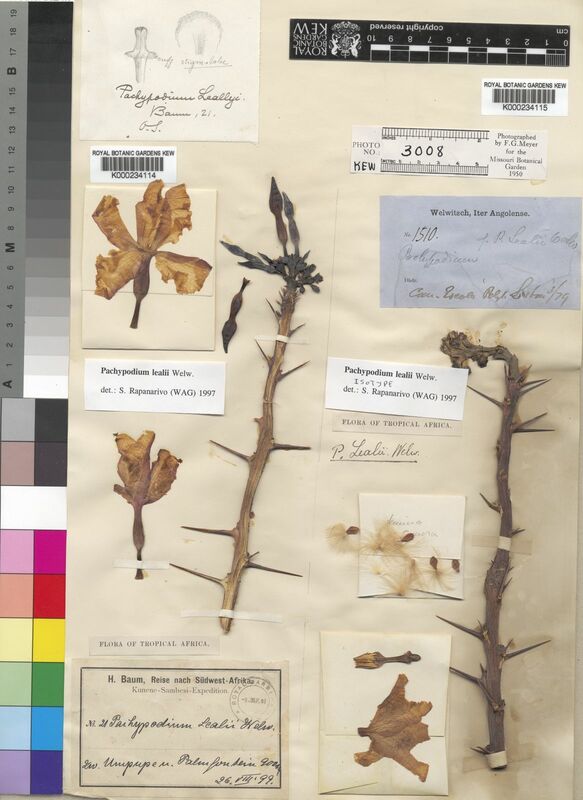 Due to this and the large distance that separates the two subspecies, most botanists treat Pachypodium lealii subsp. saundersii as a separate species, P. saundersii. 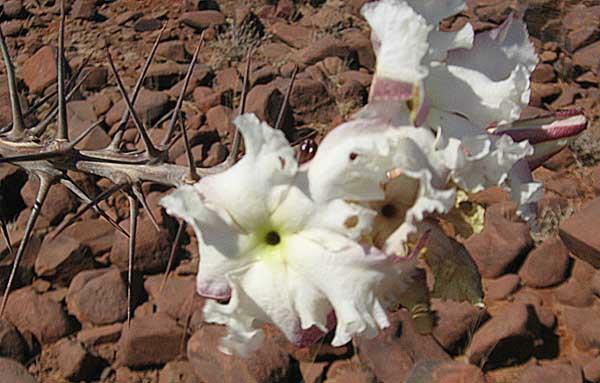 Pachypodium lealii is found in northwestern Namibia, southwestern Angola and northwestern Botswana, while Pachypodium saundersii is found in South Africa, Swaziland, southern Mozambique and Zimbabwe. Growing to a height of 1 to 8 m, with a swollen trunk and covered in slender spines, the narrow branches of this shrub or tree spread sparsely from the top of the trunk, whilst the leaves are in spiral clusters towards the tips. At flowering time, the leaves drop off, and long, pointed buds at the ends of the leafless branches open into attractive, sweet-smelling, white flowers, flushed with purple on the undersides. The conspicuous fruits are borne in V-shaped pairs of cylindrical follicles that split down one side to shed numerous seeds, each tufted at one end with a plume of hair that aids dispersal. The two species P. lealii and P. saundersii share many of the same characteristics. However, while Pachypodium lealii grows up to eight metres tall and has velvety leaves, Pachypodium saundersii rarely grows over 1.5 metres and has glossy leaves. Pachypodium lealii flowers from May to November, with a peak in August in the middle of the dry winter, while Pachypodium saundersii tends to flower earlier in the year, from February through to May. Neither Pachypodium lealii or Pachypodium saundersii appear to be under significant threat, but the lack of young specimens, and the removal of wild plants for trade, is a concern in Namibia. Both plants are listed on Appendix II of CITES, which makes it an offence to trade these plants internationally without a permit. 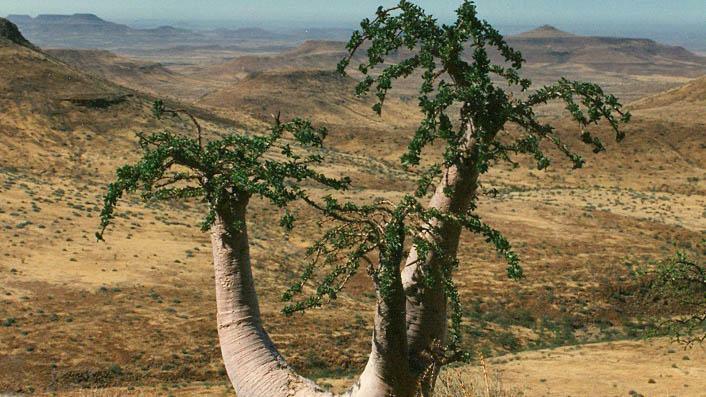 Traditional hunters in northern Namibia have used the highly toxic sap of the bottle tree as an arrow poison, and have carved drinking bowls from the wood to poison unwitting birds. 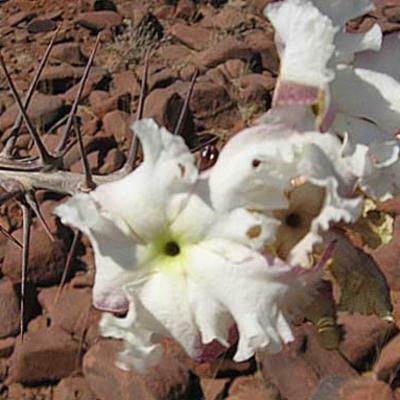 This species is reportedly the most difficult to cultivate of the continental African species of Pachypodium . It is not currently grown at Kew. The trickier Pachypodiums such as P. lealii can be grafted onto the rootstock of a more robust species such as P. lamerei to avoid roots rotting off. Occurs in arid or semi-arid environments, amongst dry scrubby vegetation on rocky hillsides or outcrops. Listed on Appendix II of CITES. As with other members of the Apocynaceae family, the sap of this plant is extremely toxic. Curtis, B.A. and Mannheimer, C.A. (2005). Tree atlas of Namibia. National Botanical Research Institute of Namibia, Windhoek. Court, D. (2000). Succulent Flora of Southern Africa. A.A. Balkema Publishers, Rotterdam, Netherlands. Rapanarivo, S.H.J.V., Lavranos, J.J., Leeuwneberg, A.J.M. & Röösli, W. (1999). Pachypodium (Apocynaceae). Taxonomy, Habitats and Cultivation. A.A. Balkema Publishers, Rotterdam, Netherlands. Van Wyk, B. and Van Wyk, P. (1997) Field Guide to Trees of Southern Africa. Struik, Cape Town. PlantZAfrica.com (March, 2009), Pachypodium lealii.